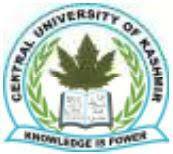 Private Secretary Vacancies – Last Date 28 February 2019 (Srinagar, Jammu and Kashmir), Central University of Kashmir recruits Private Secretary Posts. Candidates with Graduate experienced can apply. i) A Bachelor’s Degree from a recognized University/Institute. ii) At least 03 years experience as Personal Assistant in a University/Research establishment/Central/State Govt./PSU and other autonomous bodies. iii) English/Hindi Stenography speed: 80 wpm in English or 60 wpm in Hindi. iv) English/Hindi type speed: 35 wpm in English or 30 wpm in Hindi. v) Knowledge of computer applications. Proficiency in English and good communication skills. 1. All the appointees including in-service candidates shall be placed in New Pension System (NPS). 2. Mere possession of eligibility conditions shall not entitle a candidate to be called for written/skill test (or interview, where ever applicable). 3. For the post of Internal Audit Officer application form from eligible and willing candidates, may be sent through proper channel (Administrative Heads) to the Registrar Central University of Kashmir, Nunar Ganderbal (J&K), 191201. 4. The candidates appointed to the posts on deputation basis will not have any claim for the permanent appointment. However, they can be considered for the absorption against the post on the discretion of University under University/GoI norms. 5. An appointment on deputation may be made initially for a period as decided by the University, which may be extended further at discretion of the Competent Authority subject to the satisfactory performance. The University, however, shall have the right to repatriate the incumbent at any time even before the prescribed period in case his performance, integrity or conducts are found to be unsatisfactory at any stage, in the opinion of the Competent Authority. 4 6. Applications not routed through proper channel for the post of Internal Audit Officer shall not be considered. 7. The application for appointment on deputation shall be forwarded by the employer along with the Annual Performance Appraisal Reports (APARs) for the preceding five years and Vigilance Clearance Certificate, duly certified by the Competent Authority. 8. Candidate who is already in service shall submit his application through proper channel along with vigilance clearance certificate from the Competent Authority. However, he may send an advance copy of his application and in case his application is not forwarded due to whatever reasons till the time of written test or interview as the case may be, he/she, should produce a “No Objection Certificate along with the Vigilance clearance certificate in a sealed cover “from the employer failing which he shall not be allowed to appear at the test/interview as the case may be. 9. It shall be the responsibility of the candidate to assess his own eligibility for the post for which he is applying in accordance with the prescribed qualifications, experience, etc. and submit his application duly filled-in, along with the desired information and documents as per the advertisement. Suppression of factual information, supply of fake documents, providing false or misleading information or canvassing in any manner on the part of the candidates shall lead to his disqualification. 10. Acceptance of documents submitted by an applicant shall be subject to verification by the Competent Authority at any point of time even after joining the employment. If any document is found to be false/fake/incorrect either before or after appointment, the document shall be summarily rejected and action may be initiated against the candidate which shall lead to cancellation of his appointment, as the case may be. 11. The candidate shall bring all original certificates relating to his age, qualifications, experience, etc., at the time of testes/ interview. In case the candidates fails to submit the original documents for verification of the certified photocopies of the enclosures to his application, he may not be allowed to appear at the tests/interview and his candidature may be treated as cancelled without any further communication in this regard. 12. The person appointed against any post shall be governed by the Act/Statutes/Ordinances/ Rules of the University and also the CCS (conduct) Rules, 1964, CCS (CCA) Rule, 1965 or any other rules of the Government of India, as amended from time to time and any other rule/resolution prescribed specifically for maintaining the conduct of the employees by the Executive Council of the University. 13. The Appointment of a candidate shall be subject to verification of character and antecedents by the Competent Authority. Until the verification of character and antecedent’s reports are received, the appointment shall be treated as provisional. In case the report/s with regard to his conduct, character, antecedents, etc., are found to be unsatisfactory, the appointment shall be cancelled/ terminated forthwith. 14. Canvassing in any form on behalf of any candidate shall be treated as disqualification which shall lead to cancellation of candidature. 15. The reservation for the SC/ST/OBC/ PWD candidates has been arrived as per the Govt of India rules. 16. Candidates seeking reservation under OBC are required to submit certificate on the format prescribed by the Government of India, Department of Personnel & Training. SEBC candidates will be considered as OBC only if they submit the required certificate on the above mentioned f o r m a t ( available o n www.cukashmir.ac.in). Further, they shall s u b m i t t h e declaration given at the end of the application form. 17. The appointment under OBC quota is provisional and is subject to the community certificate being verified through the proper channels. If the verification reveals that the claim of the candidate to belong to Other Backward Classes or not to belong to creamy layer is false, his/her services will be terminated forthwith without assigning any further reasons and without prejudice to such further action as may be taken under the provisions of Indian Penal Code for production of false certificates. 18. Selection to Group B&C posts: The University shall conduct written test at two stages for Group B and C posts (i) A qualifying test consisting of the objective-type questions carrying 5 100 marks, and (ii) Descriptive-type test carrying 100 marks. “The minimum qualifying marks to be secured in Paper I shall be 40%. The answer scripts of the candidates for the descriptive test shall be evaluated only in respect of those candidates who secure the minimum qualifying marks in Paper I. The candidates who secure 50% marks in Paper II shall be called for skill test, wherever applicable. The marks allocated for the skill test shall be 50 and the minimum qualifying marks in the skill test shall be 25. The merit of the candidates shall be drawn based on the performance in Paper II (Descriptive test) subject to qualifying the skill test”. Notwithstanding the above, the University at its discretion may hold single written test and skill test depending upon the number of candidates, job requirements (Such as posts under Technical/Laboratory services, Engineering, Information and Communication Technology, Library services etc.) 19. The marks allocated for the interview wherever applicable shall be 50 and the credit shall be added to the credit scored in Paper-II for the preparation of the merit list. 20. The qualifying candidates for any position may be subject to skill test before issuance of formal appointment orders as may deemed appropriate by the University. 21. Candidates with foreign degrees shall be required to enclose Association of Indian Universities (AIU) equivalence certificate with their application form without which application/s can’t be considered. 22. Requirement of experience wherever mentioned in this advertisement shall mean postqualification experience only. However, in case the number of eligible candidates against any post is found to be small, the University reserves the right to consider the prequalification experience also. 23. The recruitment to the advertised posts shall be carried out in accordance with the prevalent UGC/University/GoI norms. 24. The selected candidates shall be appointed under a written contract. 25. The age of superannuation of above mentioned non-teaching posts is 60 years.